One steady bit of good economic news: Inflation remains near zero. So who would want to pay extra these days to add a dose of inflation protection in their portfolio? While the outcomes of the healthcare and financial services reform debates now in high gear in Washington will have pivotal effects on advisors this year and into next, lawmakers have yet to weigh in on another vital issue of importance to advisors and their clients: whether to let the estate tax expire in 2010. If Congress fails to act this year, the current tax rate of 45% for assets above $3.5 million will expire in 2010, and return at higher rates in 2011. Come 2011, the previous exclusion of $1 million returns, and the top rate for assets above that amount would revert back to the 55% level set in 2001. Canned come-ons cite yields unavailable to most buyers. Dozens of charities, including some with brand names, have been soliciting gift annuities over the Web citing unlikely high yields and an endorsement from a fake person who is quoted as saying she is "delighted" with her investment. James Kwak has a great response to Robert Shiller’s FT op-ed about financial innovation. But his line at the end about how “for the sake of argument, I am willing to concede that these are useful innovations that would make people better off” has been misconstrued, and it’s worth pointing out that in fact they’re not useful innovations that would make people better off. Back in 2005, a story in The Kansas City Star’s business section reported that GuideOne Mutual Insurance Co. was offering auto and homeowner policies with special discounts for churchgoers. Genworth Financial is introducing new universal life-insurance policies that add another variable customers can control to manage the premiums they pay. Contrarian economist Marc Faber is cautiously optimistic on the outlook for China, saying he sees few signs of a mismatch between supply and demand in the real-estate sector, while its fiscal policies don't appear to be repeating the mistakes made by Western counterparts. For Paul Stetter, an Advisor at Fulton Financial in Lancaster, Pa., the reason for transitioning to fees is a no-brainer. The 38-year-old advisor "didn't want to wind up at 55 working the same way I've been working for the past four years," starting from zero each month. The FDIC’s insurance fund is going broke, and Sheila Bair is wondering aloud about how to replenish it. This means one thing for taxpayers: Watch your wallets. Bair, the Federal Deposit Insurance Corp.’s chairman since 2006, says the agency has many options. One way to boost its coffers, now running low after a surge in bank failures, would be to charge banks higher premiums. It could make them pay future assessments in advance. Alternatively, the FDIC could borrow money from the banks it regulates. Or it could borrow from the Treasury, where it has a $500 billion line of credit. The Financial Industry Regulatory Authority warns on its Web site about the volatility of stocks, urging investors to "think about your risk tolerance." But the front-line regulator for thousands of Wall Street brokerage firms has been doing lots of second-guessing about its own risk-taking appetite. Despite increasing pressure to slash debt and rebuild retirement funds, nearly two-thirds of consumers do not have a written financial plan, according to the 2009 National Consumer Survey on Personal Finance. A growing corner of the insurance market, in which people collect cash for selling their life-insurance contracts, requires more scrutiny, state and federal regulators will testify in a U.S. House hearing Thursday. Attention Good Advisors: I want to know your story. Last week, I wrote a column that was critical on annuities. It sparked a bit of debate in the Bogleheads forum noting some experts in finance were now recommending them. I conceded that a low cost immediate annuity could have its place under certain circumstances including being over the age of 70 and needing longevity insurance. My favorite response, however, came in the form of a private email offering to educate me, but only if I was “serious about learning more..."
A National Association of Insurance Commissioners working group will continue consideration of a new model act on annuity sales suitability following comments from insurers and others that questioned the need for a new measure. The run in life insurance stocks may be drawing to a close, Morgan Stanley analysts said Wednesday. I have previously pointed out that we can (and should) break up the giant, insolvent banks under a number of different laws... Indeed, the government could break up the “systemically dangerous institutions” under 100-year old antitrust laws. The embattled US dollar is expected to come under scrutiny at a summit of developing and industrialized nations following China-led calls to review its role as a reserve currency. ...We can see from the Flow of Funds quarterly report put out by the Federal Reserve that households are reducing their debt at a 1.7% annual rate and business at a 1.8% annual rate. However, while the private sector gets their finances in order the Federal government is increasing its debt at a 28.2% annual rate! Purchasing life insurance is a task most people would rather put off. "Everybody wants what life insurance does, right? It provides safety for your family, it provides money when it's necessary," says Mark Pfaff of New York Life insurance Company. "It's just nobody wants to prepay for it." American families are reporting an increased desire for financial protection in these times of economic crisis, but do not have the proper financial strategy in place to fund their families’ future, according to a new survey released today and sponsored by New York Life Insurance Company. According to the survey, 83% of Americans 30 and older agree that the economic crisis has increased their desire to provide financial protection for their family. Adults aged 30 to 49 (88%) and parents with children under 18 (88%) are particularly likely to have this desire. In these challenging economic times, Americans have made numerous adjustments to shore up their family finances. Savings rates are on the rise, debt is being consolidated and slowly paid down, and people are spending and investing their money more conservatively. It may be time to add another trend to the list. According to a new survey released by the nonprofit LIFE Foundation, 56 percent of Americans say the economic downturn has made it more important to have life insurance, compared to just nine percent who believe the need has diminished. Moreover, over the past year more people appear to have added to their life insurance coverage than have lost or reduced their coverage. Former Federal Reserve Bank Chairman Paul Volcker recently said that money-market mutual funds undermine the stability of the U.S. financial system and should be regulated like banks. Attorney General Jerry Brown filed suit Tuesday against Beverly Hills investment adviser Stanley Chais, who is accused of directing hundreds of millions of dollars of client investments to Bernard Madoff. This suit seeks at least $25 million in civil penalties, restitution for victims, disgorgement of profits and compensation, and an injunction prohibiting future violations of California law. On Sept. 3, four HLS professors joined more than 20 other corporate law and finance professors and scholars in an amici curiae brief filed in the case of Jones et al. v. Harris Associates, now pending before the U.S. Supreme Court... The case, which is scheduled for oral argument on Nov. 2, involves an appeal of a Seventh Circuit decision affirming the trial court’s dismissal of the case against Harris Associates, a mutual fund adviser. The district court ruled that as long as a mutual fund adviser does not breach the fiduciary duty owed to shareholders by failing to disclose all pertinent facts or otherwise hindering the fund’s directors from negotiating a favorable price, no judicial review of the reasonableness of the adviser’s fee is required in order to dismiss a claim under Section 36(b) of the Investment Company Act. Mortgage finance giant Freddie Mac (FRE.N) said on Tuesday it would appoint as its chief financial officer Ross Kari, the current CFO of Fifth Third Bancorp (FITB.O), effective Oct. 12... Fifth Third said separately it appointed Daniel Poston, its executive vice president, as CFO effective immediately. JPMorgan Chase & Co said on Wednesday that it was eliminating some overdraft fees altogether and trimming others, after Bank of America Corp announced a similar move on Tuesday. Two years ago, RBC Correspondent Services and RBC Advisor Services, wealth management units of Minneapolis-based RBC Capital Markets, faced a strategic dilemma. Market Street Advisors owner Charles Mark Hall was charged Tuesday with embezzling money from a 90-year-old woman's annuity accounts. Annuities For The Middle Class? FA Mag: Annuities For The Middle Class? Just like the investment portfolios of most Canadians, Walter Schroeder is a shrunken version of his former self in the wake of the financial crisis... Thee 67-year-old founder of credit rating agency DBRS Ltd. has lost a noticeable amount of weight, something that acquaintances point to when speaking of the stress he and his team have endured over the past couple of years. Zero Hedge: Rating Public Pension Funds? Charles and Carolyn Hunt were proud of themselves when they bought long-term care insurance policies in 2000. The Dallas couple, who are in their 70s, thought they had found an affordable way to cover the high cost of nursing care if they someday needed it... Three hefty premium increases later, they're having their doubts. Experts who work with the wealthy and observe their spending habits say rich folks are sitting on their cash. Just like the rest of us, they're worried about the future. Suddenly uncomfortable with the nation's financial volatility, the wealthy are revisiting their investment and savings strategies, says Chris Geczy, director of the Wharton Wealth Management Initiative at the Wharton School in Philadelphia. Once you have your Social Security Strategy down, there's just one little retirement question left to consider: How can you make the money that you've so diligently saved provide the life you want for as long as you live? Oh. That. Many older Americans, who are strapped for cash and as anxious as the rest of us, are selling an unlikely asset: their life insurance policies. The strategy, as it turns out, isn’t new. Once reserved for wealthy business executives who cashed in their company’s multimillion-dollar insurance policy when they retired, during the recession it’s become more widely used by policyholders. An official from the New York State Insurance Department said that state insurance regulators from across the country expect to discuss the possibility of scratching Moody’s Investors Service from a list of acceptable rating organizations when they meet later this week, according to Reuters. Moody’s Investors Service has assigned strong financial ratings to USAA Property and Casualty Insurance Group and USAA Life Insurance Co.
Seeking to replenish capital depleted by souring real-estate investments, many insurers have cut back on sales and raised prices on life insurance, much as banks have reduced lending and raised fees to customers to rebuild their cash cushions. Middle-class Americans and women make up the lion’s share of non-qualified annuity holders, according to a survey from the Committee of Annuity Insurers. While the economy appears to be dragging down life insurance sales, middle-class Americans are hanging onto their personal policies and preserving important protection in an uncertain financial environment (see also First Command Financial Services). After nearly two years of declines, the net worth of Americans rose by $2 trillion to an estimated $53.1 trillion in the second quarter compared with the first three months of the year. The soaring stock market accounted for much of the gain. Stock holdings rose by 22% to $6.3 trillion, while mutual funds' value jumped 15% to $3.7 trillion, according to a Federal Reserve report released Thursday. The Department of Labor is killing a regulation issued in the last days of the Bush administration allowing advisers affiliated with mutual funds, brokerage firms and other companies that sell investments to provide investment advice to 401(k) participants, Investment News reported. Today, contrary to what our elected government officials would like us to believe, the overall U.S. economy is not seeing much, if any, significant improvement. And because we're getting more and more calls from struggling agents, advisors and planners asking for help selling cash-value life insurance, we believe the ideas and tips in that previous article (Pt. 1) are worth revisiting. Parents of college-bound students are projected to be able to meet only 11% of future higher education costs, down from 15% in 2008, according to the study released today by Fidelity Investments. Results from a Gallup survey released today demonstrate that non-qualified annuities contribute significantly to the retirement security of middle-class Americans, and that those who own annuities have great confidence in their financial future even amidst the recent recession and market downturns. In recent years, some insurers have begun to offer long term care insurance (LTCII) coverage in the form of riders to life insurance policies. These riders are often referred to as "living benefit" or "living needs" riders. The LTCI benefits offered under these riders are similar to those found in an LTCI policy. The benefits may be defined as a specific daily amount or as a percentage of the face amount of the policy (up to a specified maximum). Under an "independent" program, the LTCI rider will not affect the policy's death benefit (or cash value), but in an "integrated" program, any LTCI rider benefits paid will result in a reduction of these values. An opinion piece in the The Wall Street Journal did a bang-up job of analyzing the health “reform” proposal put forth by Sen. Max Baucus, and endorsed by President Obama. Manulife will launch a new segregated fund platform in early October with three investment series to offer Canadian investors attractive solutions for their accumulation, income and estate planning needs. Nurses appear to be taking far better care of their patients than they are their financial futures, according to a survey by the Center for American Nurses and the Women's Institute for a Secure Retirement (WISER). The Nurse Investor Education Survey reveals that nurses may be saving for retirement, but few are planning and investing to meet retirement needs and most say they do not know what their needs will be. In response to local media reports from China that some foreign insurance companies may be planning to scale back operations in the PRC, Manulife Financial today affirmed that it continues to focus its strong operational growth in China through its highly successful Manulife-Sinochem Life Insurance Co. Ltd. partnership, which is currently licensed in 36 cities across 10 provinces in China. The Manulife-Sinochem partnership has more than 11,000 professionally-trained staff and agents serving over 450,000 customers. The economic collapse of the last year has left many academic employees worried about how they will afford retirement. But despite evidence of these fears, as documented in a survey by TIAA-CREF, shifts in retirement strategies have been relatively modest. Majorities of those surveyed -- 1,002 academic employees aged 50-70 -- have not changed how much they save for retirement or their asset allocations. "There was no panic here," said Paul J. Yakoboski, principal research fellow at the TIAA-CREF Institute. "There was a calm, reasoned response..."
When stocks tumbled at the end of 2008, it made a lot of casual investors gun shy. They discovered that their appetite for risk was lower than they had thought. The market being what it is, there were people ready to make a buck to meet the needs of the newly cautious. Midland National is applying for state aid for expansion that would add 86 new jobs, but plans are not yet final... West Des Moines will loan a local insurance company $25,000 as part of an application for $125,000 in state money to help pay for an expansion that promises 86 new jobs over three years. Sales of long-term care annuities, a kind of insurance against long-term care, have been declining this year. But industry watchers expect that trend to reverse in 2010, when new federal rules kick in. Starting next January, no federal income tax will be due on the proceeds of up to two to three times an annuity’s account value if used to pay for long-term care, thanks to the Pension Protection Act of 2006. Companies offering hurricane and other property insurance coverage may need to raise rates because they're losing money, even though Florida hasn't had any serious storms in the past couple years, the state insurance commissioner said Tuesday. For some Ohioans, the memory of Hurricane Ike is only surpassed by the damage it caused last September 14 as it made its way across the Buckeye State packing winds at speeds equal to a Category 1 hurricane (up to 74 mph). Strong winds moved diagonally across the state from southwest to northeast over a four-hour period that Sunday afternoon, according to Ohio EMA reports. Losses compiled by insurance companies and state government mounted over time, capping Ohio’s largest natural disaster in recent history - the Xenia tornado of 1974. Death and Taxes: Are These Two Certainties a Good Place to Invest as the Boomer Generation Ages? The Wall Street Transcript has just published its Funeral Services and Tax Preparation Report offering a timely review of the sector to serious investors and industry executives. This 57 page feature contains expert industry commentary through in-depth interviews with public company CEOs, Equity Analysts and Money Managers. For many financial services professionals focusing on the retirement market, the baby boomers provide both the greatest challenge and the greatest opportunity we'll face in our careers. Some advisors are even in denial, claiming to "only work with seniors." The fact of the matter is, the first of the boomer generation is turning 62 years old this year. Jack Marion recently did a study claiming that the average age of an indexed annuity buyer is, you guessed it, age 62. AXA Distributors, John Hancock, Lincoln Financial, Pacific Life, and SunAmerica topped the list of the best variable-annuity websites for advisors in a new survey by New York consultant, Kasina. “All of these sites did a really good job of servicing advisors’ books, showing how contracts are set up, plus information on holdings, performance and transactions,” says Mike McLaughlin, a senior managing consultant at Kasina. MetLife’s chief financial officer, William Wheeler, sees opportunities for deals coming out of the recession. He said Tuesday that MetLife, the largest American life insurance company, was better positioned to acquire businesses outside the United States after the financial crisis cut into other insurers’ ability to make competing bids. Pricing war erupts in market share battle with rival Schwab - Fidelity Investments, responding to The Charles Schwab Corp.'s June announcement of price reductions for independent advisers and their clients, is rolling out a competing program with a few extra twists. Citigroup Inc (C.N) shares closed down almost 9 percent on Tuesday after reports the government might begin shedding its stake in the New York-based bank... Citigroup, eager to escape the burden of a significant government ownership stake, is in talks with U.S. officials about selling part of the government's 7.7 billion shares in the bank, sources familiar with the situation said. Genworth Financial Inc., the life insurer and mortgage guarantor, raised about $564 million in a stock sale, more than planned, after selling 48 million shares... The stock sold for $11.75 a share, according to a company statement issued yesterday. The Richmond, Virginia-based insurer had announced plans to raise $500 million. The Securities and Exchange Commission has set up an agencywide task force to examine a financial product in which people collect cash for selling their existing life-insurance contracts. In a SPIEGEL interview, Harvard historian Niall Ferguson discusses the turbulent history of money, the inevitability of financial crises and the fatal influence mathematicians have on the monetary system. SPIEGEL: Professor Ferguson, can you show us the contents of your wallet? Ferguson: If you like, sure. Have a look. I have about a hundred dollars on me. SPIEGEL: Why do people consider such green-printed pieces of paper to be so valuable? Utilizing the benefits of a life insurance policy can help you to make sure your loved ones are financially secure should something happen to you. Many people hate to have to think of life insurance. It is not an exciting topic and most think they have plenty of time to ensure the future of their dependents. This is not always the case. Anything can happen at any time and this is one reason why the life insurance is so valuable. It helps to take some of the financial risk out of the unexpected. American International Group Inc. offers some "living-benefit" guarantees to policyholders on stock-market linked variable annuities, but the insurer may not easily attract buyers to its SunAmerica businesses if it puts them up for sale. The industry is moving away from these guarantees as they've become too costly for companies to offer, an expert said. AXA Equitable Life Insurance Company and its affiliate MONY Life Insurance Company of America (MLOA) introduced today, in states where approved, a revamped edition of the flagship Incentive Life(R) Legacy (IL Legacy(R)) Series of variable universal life insurance. Today's IL Legacy II is a highly competitive variable life insurance product offering investment growth potential with access to a variety of risk mitigation strategies, long-term lapse protection, a chronic illness funding option and the ability to leave a charitable legacy. Hartford Financial Services Group Inc. is hoping a team-oriented approach can boost sales, but its effort to align its sales force is a bit too late to be considered innovative. The Simsbury, Conn., company announced last week it combined sales and distribution for its investment and retirement products into a unit called Hartford Life Distributors. It combines the internal and external sales units, marketing and sales support teams, strategic relationship management groups and business development areas that support Hartford's mutual funds, annuities, 401(k) retirement plans and 529 college savings program. U.S. investors are on “an incredible risk-seeking mission” that belies a still-shaky economy and financial system, according to Gina Martin Adams, a strategist at Wells Fargo Securities LLC. Focus is on securitizing life policies - A New York Times article comparing the bundling of life insurance policies to the packaging of mortgage-backed securities is generating quite a bit of notice in the life settlement industry. Retirees seek three to five year terms - Immense stock market volatility has driven retirees to buy annuities, helping Challenger experience record sales in August... Challenger Financial Services Group sold a record $90 million-plus of annuities in August as retirees sought stable income amid stock and bond market volatility. 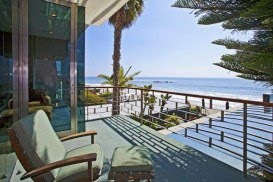 Now after seeing pictures (via Calculated Risk) of the foreclosed Malibu mansion where a Wells Fargo executive partied up, we can totally see why they did it. Planning for income for the rest of someone's life is not to be taken lightly. As many advisors have experienced, this exercise is wrought with issues and pitfalls, including (but not limited to) qualified vs. nonqualified funds, 401(k)s, IRAs and Roth IRAs, tax law, withdrawal platform vs. annuitization, income benefit riders, senior health issues, etc. Thinking of working a bit longer and delaying your retirement? Mind the pitfalls. True, postponing retirement can have its advantages -- you can delay tapping your 401(k) nest egg and may even add to it while you're working. But you can run into problems if you begin collecting Social Security checks or taking withdrawals from some tax-deferred retirement plans while you earn a paycheck. Generally speaking, overstaying your welcome at work could have some serious health care, Social Security and pension ramifications. Consider these four factors before signing on for another year. The new boss isn't turning out to be the same as the old boss. Where former American International Group Inc. CEO Edward Liddy initially planned to swiftly liquidate many of the company's subsidiaries in an effort to repay its $80 billion in government loans, new chief Robert Benmosche seems to have a different strategy in mind. A full-blown trade row erupted between the US and China after Beijing accused Washington of “rampant protectionism” for imposing heavy duties on imported Chinese tyres and threatened action against imports of US poultry and vehicles. A year after the onset of the financial crisis, advisers remain wary of insurers' financial health when recommending products, according to the InvestmentNews 2009 Insurance Product Survey. This year, 58.6% of the 953 advisers surveyed indicated that an insurer's financial rating was the most important factor they considered when recommending life insurance to clients. That's up from the 47.0% who cited it in 2008. China announced dumping and subsidy probes of chicken and auto products from the U.S., two days after President Barack Obama imposed tariffs on tires from the Asian nation. The Meli family once ran a Flint warehouse that kept perishable goods from spoiling. Now it seems their money -- nearly $200,000 -- is stuck in storage. Sheryl J. Moore is mad as hell at the media, and she's not going to take it anymore. A replacement may get started in your mailbox. You receive an invitation to attend a luncheon seminar on annuities sponsored by a local investment or insurance firm. You already have an annuity from the proceeds from your previous job's 401(k). You were impressed with the seminar presentation. You may then be solicited by the event sponsor's representative to surrender your current annuity for a new annuity that was presented at the seminar. On Oct. 22, 2008, the House Committee on Government Oversight and Reform held a hearing entitled: "Credit Rating Agencies and the Financial Crisis." In a new research paper, a former U.S. Treasury official and a former World Bank economist suggest that a blend of mutual funds and income annuities is the best way to manage wealth and provide income in retirement. Mark J. Warshawsky and Gaobo Pang put six payout methods through thousands of Monte Carlo simulations. Their findings show that, in terms of generating income and leaving a legacy, it makes sense to annuitize 25% of one's savings at retirement. Americans' household income last year took the sharpest drop since the government began keeping records in 1947, the Census Bureau reported Thursday. Median household income sank 3.6% to $50,303, after adjusting for inflation, during the first full year of the recession. Aviva recently put on a Webinar on college planning that wasn't bad. The speaker explained one of the few situations where using cash-value life insurance (CVL) actually works for college planning. What does that have to do with selling to seniors? It can help you decide whether or not seniors represent a “world-class” market for you. Sure, seniors can be a viable market for anyone, but does your personality fit them and their needs? While that may seem like a fairly straightforward question, there are many hidden implications to address in making that determination. Insurer Alico Japan has compiled a report that says its customers' credit card data appears to have been leaked from the inside, rather than being stolen by outside hackers, sources familiar with the matter said Friday. ...A Connecticut state court judge ordered UBS to set aside $35.5 million to fund a potential judgment in a case where hedge fund Pursuit Partners LLC alleges UBS sold it investment-grade debt securities in 2007 that UBS knew would soon be downgraded. The lawsuit, now unsealed, has a 146-page complaint amendment with 57 plaintiffs and three additional defendants. We recently got an updated G.19 from The Fed that contained "revised" consumer credit numbers that showed the top in consumer credit (all but mortgages) was in fact in July of 2008, not January of 09 as previously reported... This morning the US Census released its update with per-capita income numbers for 2008 being released. As Hartford Financial Services Group Inc. (HIG) rebuilds, it will focus more on insurance than annuities, said the company's chief executive Thursday. Nearly two-thirds (59 per cent) of consumers have not looked into how best to achieve their financial goals and the same proportion have not considered seeking professional financial planning advice. Treasury Secretary Henry M. Paulson Jr. left his suite at Manhattan’s Waldorf-Astoria Hotel last Sept. 15 after a sleepless night, feeling he’d done all he could to minimize the damage from that morning’s collapse of Lehman Brothers Holdings Inc., aides said. As thousands of military personnel prepare to return from deployments in Iraq and Afghanistan in the coming months, they should review their insurance coverage to make certain that they and their families stay protected no matter where they are, according to the National Association of Insurance Commissioners (NAIC). Americans are looking for ways to spend less, but when it comes to life insurance they’re holding on to their policies, according to a recent report entitled, The Value of Life in Tough Economic Times issued by Prudential Financial, Inc. The study found that 93% of consumers consider life insurance a “must.” Despite the fact that 70% have cut back on routine expenditures, 84% indicate they view the cost of life insurance as relatively minimal when compared to other items in the household budget. John Hancock Financial Services has expanded its participation in the Build America Bonds program, recently completing another nine transactions that will help state and local entities across the United States rebuild their infrastructure as well as further strengthening the economic recovery of the nation as a whole. Since the program's inception in April as part of The American Recovery And Reinvestment Act Of 2009, John Hancock has invested more than $600 million in transportation, utility and higher education projects as well as general obligation investments across the United States. Massachusetts life insurers and regulators are on high alert due to Wall Street’s latest scheme to make a buck: betting on when people die. Insurance Quotes.us, will introduce a new tool for consumers approaching retirement. MetLife Inc (MET.N) expects its sales of stock market-linked retirement products to exceed 2007 levels as it picks up business from weakened rivals. With $13.3 billion in fixed and variable annuity sales in the first half of 2009, MetLife is on pace not only to repeat as the top U.S. seller of annuities but also to exceed its 2008 sales of just under $20 billion, according to LIMRA sales rankings. The biggest-ever bank collapse didn't lead to chaos, but Americans will pay the price for its unsound lending for years to come. Washington Mutual is long gone, but its lax lending could haunt us for years. Dollar Collapsing, Gold Soaring: Are The Gold Bugs Finally Right? For longer than anyone can remember, gold bugs have been predicting the demise of paper-based currencies and the rise of their favorite yellow metal. Yesterday, gold cracked $1,000 per ounce, a level it has broken only briefly in the past. And the dollar continued its collapse. So are the gold bugs finally right? Should you swap all your dollars for gold dust and stash it in a safe-deposit box (maybe picking up some guns and cat food while you're at it)? Yahoo! Finance: Dollar Collapsing, Gold Soaring: Are The Gold Bugs Finally Right? The new buzz phrase in Washington, D.C. these days is “health care reform,” which has become a top priority of the Obama Administration. The last time Congress took up this issue, Secretary of State Hillary Clinton was first lady and her plan for universal health care, after much acrimonious debate in Congress, never made it to President Bill Clinton’s desk for a signature. The survey, released Tuesday, found that 44% of retired individuals are supporting at least one individual financially. Children (53%) and grandchildren (37%) top the list of such dependents. An additional 12% are contributing to their parents' finances. As Congress debates reforms for how Americans save for retirement, a new study shows that most workers do not understand their retirement savings plans as well as other employer-provided benefits, indicating an acute need for more education. This year, as with many preceding years, variable annuities are a good deal for insurance companies but a lousy deal for investors. This isn’t personal. It’s about numbers. Just as managed mutual funds have to swim against the tide of their own expenses, variable annuities swim against an even faster tide of expenses. Regulators are looking for ways to increase accounting safeguards for investment advisors who have custody of client assets, but an investment advisor's group says some of the proposed changes are too broad and go too far. In the east and west, bankers are looking to the life insurance industry to give the financial system a fresh dose of vitality. But the wildly different approaches stand to impact life insurers in equally opposite ways. While the economy appears to be dragging down life insurance sales, middle-class Americans are hanging onto their personal policies and preserving important protection in an uncertain financial environment. If time is money, technology is like a high-yield investment that keeps paying out time-saving dividends to savvy insurance agents. New and enhanced online tools are now available to help agents become more productive and effective in sales, agency management, marketing and client services. Events of a year ago brought some economic pain to American International Group Inc.'s life insurance subsidiaries. These came in the form of higher surrenders and lower premiums, deposits and other considerations for both life insurance and retirement services, according to AIG's second-quarter report. The poverty rate among older Americans could be nearly twice as high as the traditional 10% level, according to a revision of a half-century-old formula for calculating medical costs and geographic variations in the cost of living. Gold rose to the highest price since March 2008, passing $1,000 an ounce, while silver climbed to a 13-month high as a weaker dollar and concern that inflation may accelerate boosted the appeal of precious metals.